Plant Growth Regulators (PGR) Market size is forecast to exceed USD 9.7 billion by 2025; according to a new research report by Global Market Insights. Global PGR market will be driven by increasing investment in the agricultural sector. Europe Union is planning to invest approximately USD 426 billion in the coming years under its Common Agricultural Policy (CAP). This increased investment in agriculture shall fuel the PGR demand over the forecast duration. Moreover, agricultural land in Europe is decreasing due to commercial and industrial development projects, which has impelled governments to encouraging the usage of plant growth regulators for enhancing the yield within available arable land. Low awareness about PGR in emerging economies is likely to hamper the plant growth regulators market demand during the forecast period. Moreover, due to limited product knowledge, consumers use it excessively which affects the product quality and marketability. 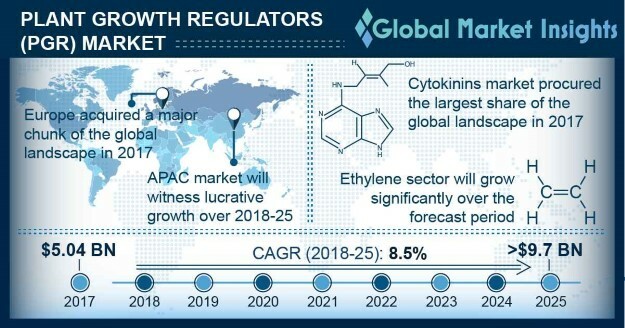 Ethylene plant growth regulators market shall grow with highest CAGR during the forecast period. This can be attributed to the increasing fruit farming across the globe. Increasing trend of health and fitness, fruit consumption across the globe is increasing and to fulfill this increased fruit demand, ethylene usage for fruit ripening has been rising from past several years. Auxins demand is projected to grow with a significant CAGR, owing to its rising usage in seed germination. In addition, auxins are also used in all application segments for cell division, root initiation and other such processes. Vegetables & fruits segment accounted for the largest plant growth regulators (PGR) market share in 2017 and is anticipated to hold its position over the forecast period. Cereals & grains are likely to experience a high demand in next few years. This can be attributed to the increased PGR usage in nations including China, India, Vietnam, Japan where cereals & grains are the major crops. Many countries have begun exporting grains owing to its high demand. Asia Pacific plant growth regulators market shall experience the highest CAGR during the forecast timespan. This can be attributed to high dependence on the agriculture and increasing awareness about plant growth regulators in the region. MEA will also grow with a healthy CAGR. Many foreign firms and individual investors are investing in the region. They are taking agricultural lands on lease and producing commercial crops. The PGR market comprises of many large multinational players. Some of the prominent players operating in the industry are DowDuPont, BASF SE, Syngenta AG, Nufarm Limited, Bayer AG, Nippon Soda Co., Ltd., Valent Biosciences LLC, Tata Chemicals Ltd, Arysta Lifescince and Adama Agricultural Solutions Ltd. In October 2017, BASF SE announced the biggest acquisition in its 152 years history. It acquired significant part of Bayer’s seed and non-selective herbicide business in USD 7.03 billion. After this acquisition, BASF entered first time in seed business.